When I saw these beautiful large turkey thighs I couldn’t help but think… ‘Cool, I bet these would make a great Cacciatore. And sure enough, they did. Delicious in fact. 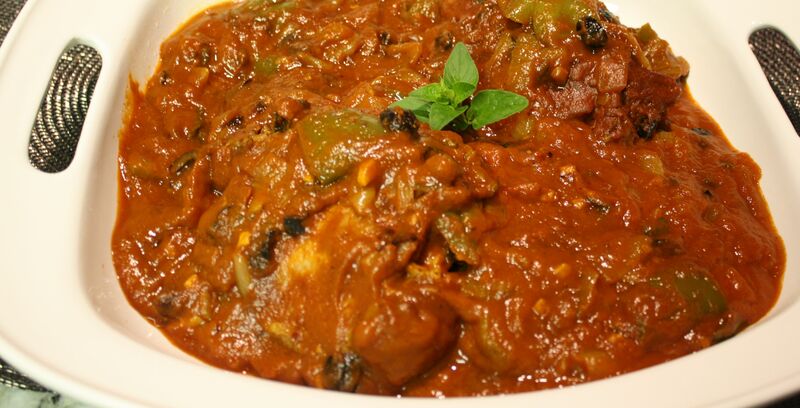 I have two secret ingredients that I add in my Cacciatore and I am going to share them with you today. This is a great dish to make for a crowd. You can prepare it ahead and let the oven do the rest. I love making meals that allow me to enjoy my guests. So if you are making it for a crowd use a cut-up chicken or chicken thighs instead. You will also want to cut the time by about 30 minutes as the turkey thighs are very large by comparison. Enjoy! Preheat oven to 425 degrees. Heat a cast iron pan on medium-high until good and hot. Place turkey thighs skin side down and allow to cook hot for 6 to 7 minutes. Use a splatter guard if you don’t like to clean every surface in your kitchen. On reverse side of thigh while skin is cooking, sprinkle pieces with a tablespoon of flour and salt & pepper. When turkey skin is browned and crisp and fat has rendered, flip thigh to floured side. While turkey is skin side up, remove crispy skin and set aside, (I saved this skin for another dish I will be making next weekend for date night). While flour side down turkey is cooking, add flour to the side you just removed the skin from in the same manner. When side down becomes well browned, turn turkey over and repeat. Once turkey is browned on both sides, remove from pan and set aside on a plate. You eliminate the third browning process if you want to keep the skin on, but I don’t. Reduce heat to medium; add anchovies and onions. Cook onions for about 5 minutes until they start to become tender and translucent. Next add garlic and saute another three minutes. Add peppers for another 3 minutes of cooking. Next add the wine and chicken stock and reduce by half. In a larger oven roasting pan add contents of cast iron pan, turkey thighs, two cans of tomato sauce, chopped herbs and salt cured olives. Cover, place in oven and cook at 425 for 45 minutes. Reduce heat to 350 and cook additional 45 minutes. Remove from oven and rest for 15 minutes and serve with rice, pasta, quinoa, whatever you desire. Well done, I say, very well done!! You sure can… The leftovers were even better.